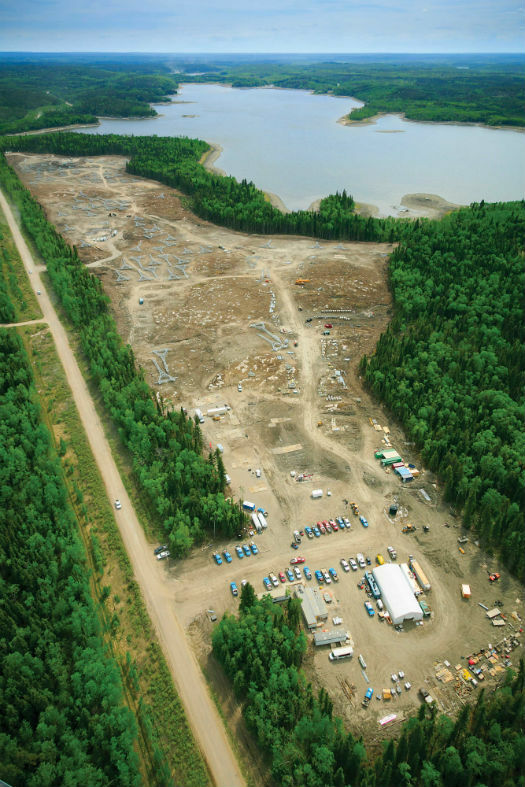 The I1K transmission line in Northern Saskatchewan is one of several major power line construction projects either currently underway or recently completed in Canada. During the peak of activity on the line, up to 15 helicopters were working on it. For those working in the utility sector in Canada, the last couple of years have not been particularly kind. Mineral exploration has slowed to almost a standstill; tanking oil prices have stunted development offshore and in the robust oil sands market in northern Alberta; and while extensive firefighting operations provided much-needed work in Western Canada this summer, the opposite was true on the East Coast. But even though the current situation has proved to be something of a perfect storm, there are still sectors that have provided a relatively stable source of work for some utility operators over the past few years. One of the most notable among these is power line construction, fueled both by the need to bring reliable power supply to the growing populations of remote settlements, and the need to replace aging transmission lines that are reaching the end of their natural life. 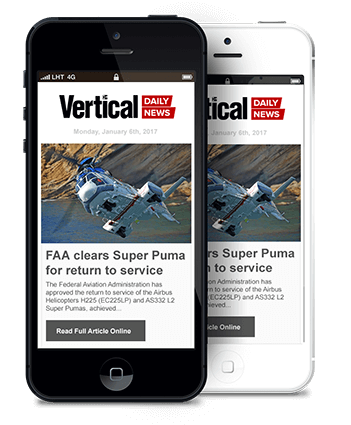 Within this sector, there have been several major projects that have been so large in scope that they have required the services of entire fleets of aircraft — and made headlines in mainstream media. Among these are the Northwest Transmission Line and Interior To Lower Mainland project in British Columbia, the upcoming Muskrat Falls project in Newfoundland and Labrador, and the ongoing I1K power line project in Northern Saskatchewan — to which the only access is by air. 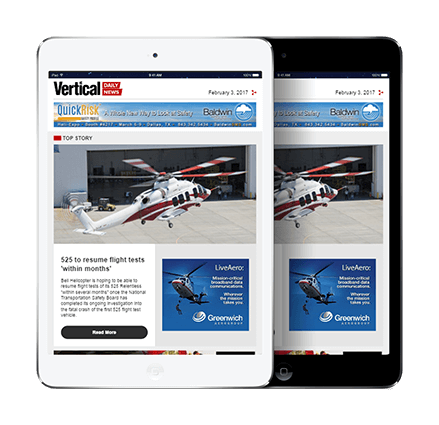 Vertical spoke to those who have worked on these major projects to find out what life is like on the line. 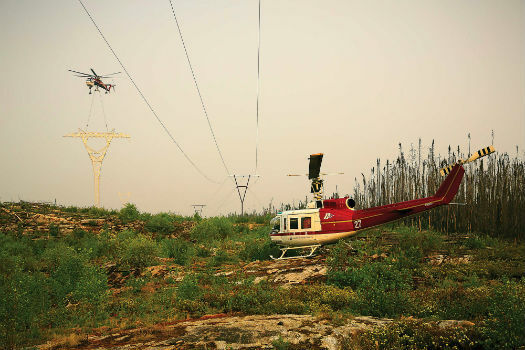 Of all the herculean power line construction projects recently undertaken in Canada, the I1K power line project in Northern Saskatchewan may be one that demands industry attention more than any other; everything required to create the 300-kilometer (185-mile) stretch of power line — from the initial survey to the stringing of the line — has had to be either be flown in or completed by air. The three-year C$200-million project, scheduled be completed at the end of October, saw the construction of the line along the right-of-way of an existing power line that travelled northwest from the Island Falls hydroelectric power station to the Key Lake uranium mine. There were only three access points for the project: at the terminus points of Island Falls and Key Lake, and at Lindsay Lake, roughly halfway between the two. The task of completing this challenging project fell to experienced contractor Valard Construction, which won the contract for the work from utility provider SaskPower. Valard also managed the NTL project in B.C., and is the main contractor on the Muskrat Falls project on the East Coast. 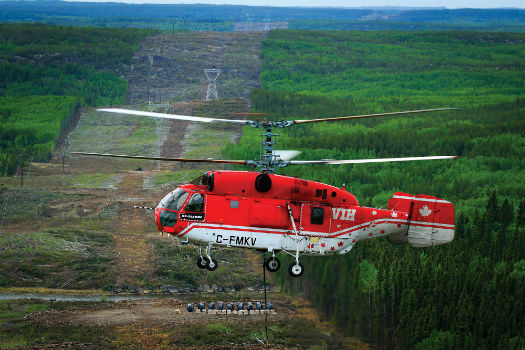 VIH Helicopters had a Kamov Ka-32A11BC working on the I1K transmission line for almost two full years. A second Ka-32 joined it during peak construction times. Ross said the I1K was one of the most spectacular of a range of projects Valard was working on. 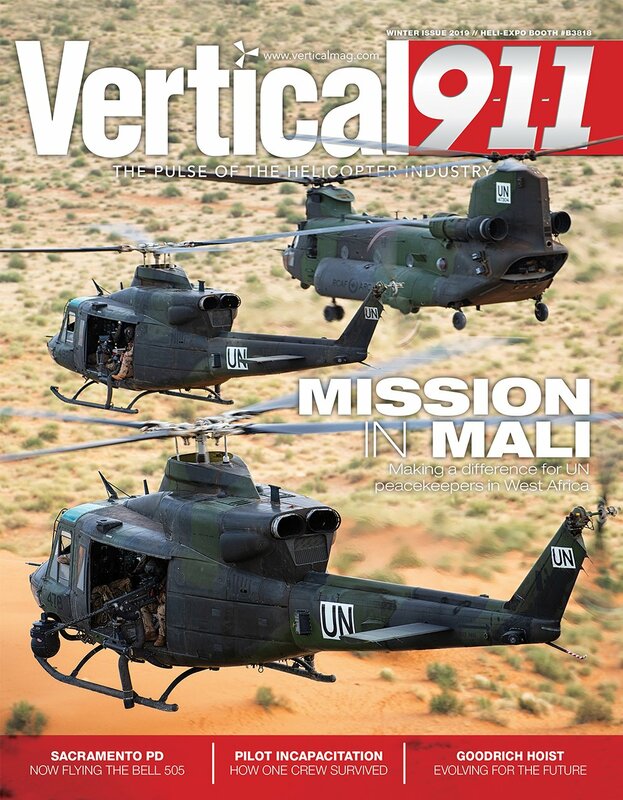 In addition to Valard’s own fleet of two Airbus Helicopters AS350 B3 AStars and an Eagle Single (a Bell 212 converted to a single-engine aircraft by Eagle Copters), the company has used a Sikorsky CH-54B, two Kamov Ka-32A11BCs, Bell 212s, Bell 205s, Bell 407s, and AS350 AStars from outside operators on the project. Because of that, Valard has built up a trusted pool of operators to use on its projects, but it also tries to hire local companies as often as possible. Among those working on the I1K project were Airspan Helicopters, Helicopter Transport Services, Arrowhead Helicopters, Helifor, VIH Helicopters, Vortex Helicopters, and Transwest Air. 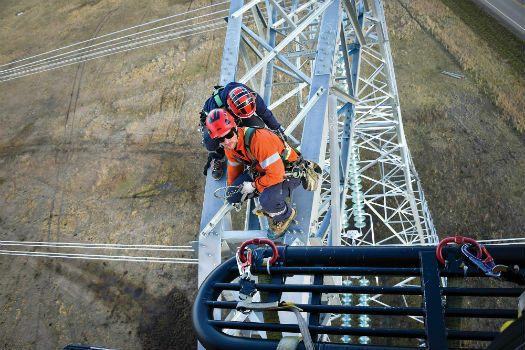 Justin LeBlanc, assistant project manager with Valard Construction on the I1K transmission line, said that a typical day on the project began with a morning meeting — known as a tailboard — during which the team would create an action plan for the day’s work. Aircraft maintenance would generally be completed overnight to ensure a full productive day, and the helicopters would be divided into long lining or crew transport roles, saving the time it would take to change the configuration of an aircraft from one to the other. An MD 500E from Vortex Helicorp on the I1K near Island Falls, Sask. Duties for the 500E varied, but mainly consisted of power line “threading” (pulling the cable through a traveller pulley on the towers) and crew movements. In addition to dealing with poor weather during the fall and winter in Northern Saskatchewan, Ross said the main challenge for those working on the job was the high intensity of the traffic. ￼Valard chose Helicopter Transport Services’ Sikorsky CH-54B — rather than an Erickson S-64 E or F model — for its enormous 25,000-pound lift capacity. 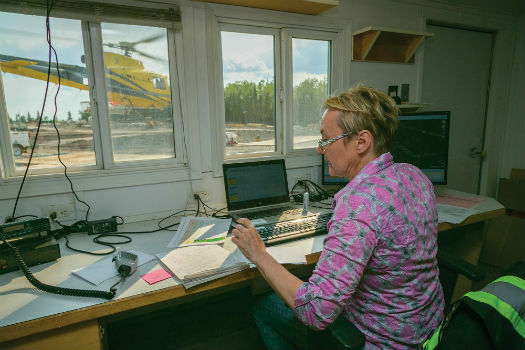 Sherey Byra, a helicopter coordinator/dispatcher for Valard on the I1K project, said the best tool the company had was the TracPlus system, which was compatible with a wide variety of flight tracking systems, allowing her to see every aircraft from every operator on the project at any given time. She said the biggest challenge of her role was getting all the aircraft out in a timely and efficient manner each morning — and then working through the various requests from crews out in the field. “You have to know how to prioritize, and that basically just comes from management — because what type of crew is a priority today may not be the same type tomorrow,” she said. 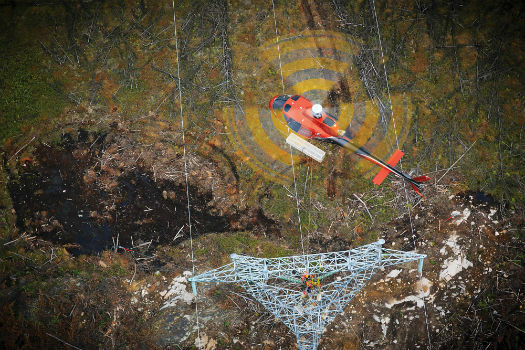 There has been something of a boom in major power line construction projects across Canada, with two in B.C., one in Saskatchewan, and another recently beginning in Labrador. The I1K project proved to be almost tailor-made for the Kamov Ka-32A11BCs of VIH Helicopters, which was used to move the foundation crews’ loaders and equipment, as well as slinging the towers themselves. VIH had one of its Ka-32s working on the project for almost two full years, and it was joined by a second for several months during peak times. 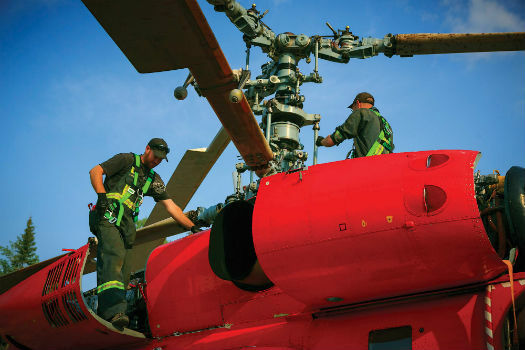 The operator has focused in on the heavy-lift market in recent years, with an “intentional restructuring” of its fleet distilling it to just five aircraft — four Ka-32s and a Sikorsky S-61. The I1K line spans 300 kilometers — and every tower on it had to be placed by helicopter. Mycroft said the weight of the towers on the I1K project — about 10,800 pounds or 4,900 kilograms — was a perfect fit for the Ka-32’s lift capacity. Tom Schneider, a VIH pilot who flew the Ka-32 on the I1K project, said the aircraft’s lift performance and precision capabilities made it well suited to the work. 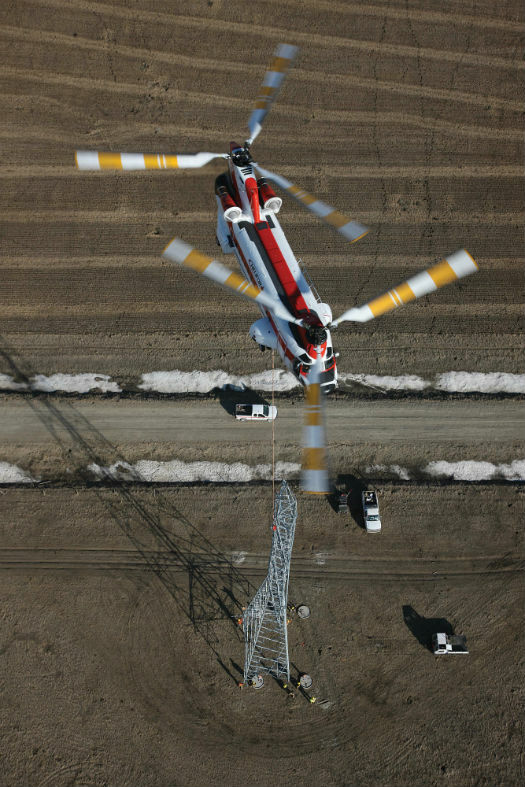 The size of the towers on the I1K transmission line — weighing about 10,800 pounds — were well suited to the Ka-32’s 11,000-pound lift capability. 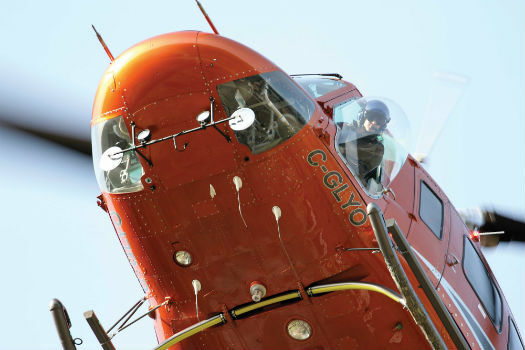 Joining VIH in doing the heavy lifting on the project was Helicopter Transport Services (HTS), which is based near to the line in La Ronge, Sask. The operator used its Sikorsky CH-54B on the project (at one point using two of the heavy lift juggernauts, which can lift up to 25,000 pounds/11,340 kilograms on the hook), but also had a unique agreement with Valard that took advantage of HTS’ diverse range of aircraft. 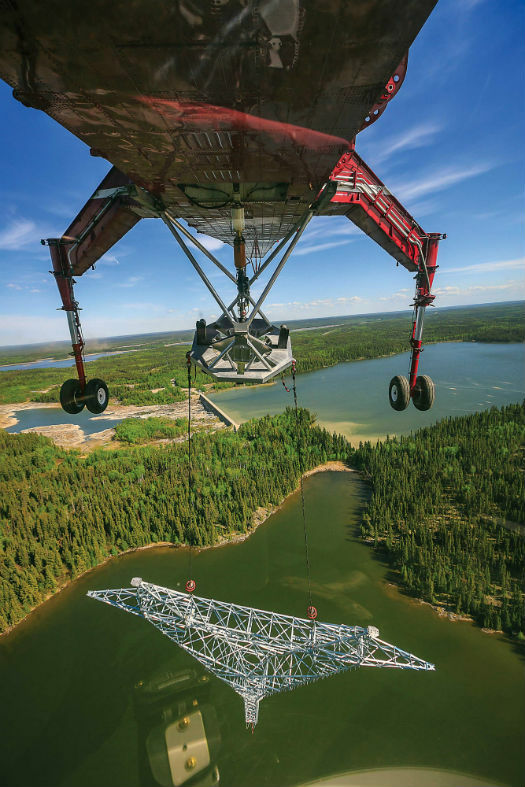 Through a unique agreement with contractor Valard, a range of aircraft from Helicopter Transport Services were utilized on the construction project in Saskatchewan. Mike Lavoy, vice president of marketing and communications at HTS, said the I1K project was the biggest job the company had completed in the last year. Helicopter dispatcher Sherey Byra said the main challenge on the I1K project was getting all the crews out in a timely manner in the mornings. 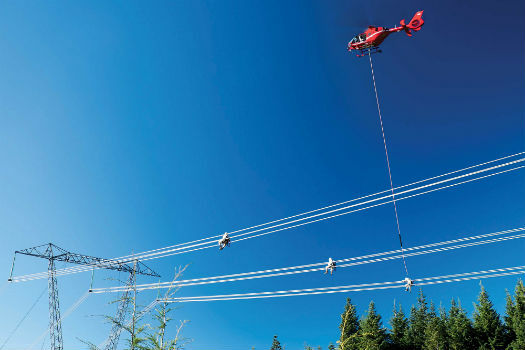 On Canada’s West Coast, the two major power line projects — the Northwest Transmission Line (NTL) and Interior To Lower Mainland (ILM) project — have been among the largest construction projects in the province of British Columbia for several decades. And both made extensive use of helicopters. The $746-million NTL spans 344 kilometers (214 miles) between the city of Terrace and a new substation near Bob Quinn Lake in B.C. 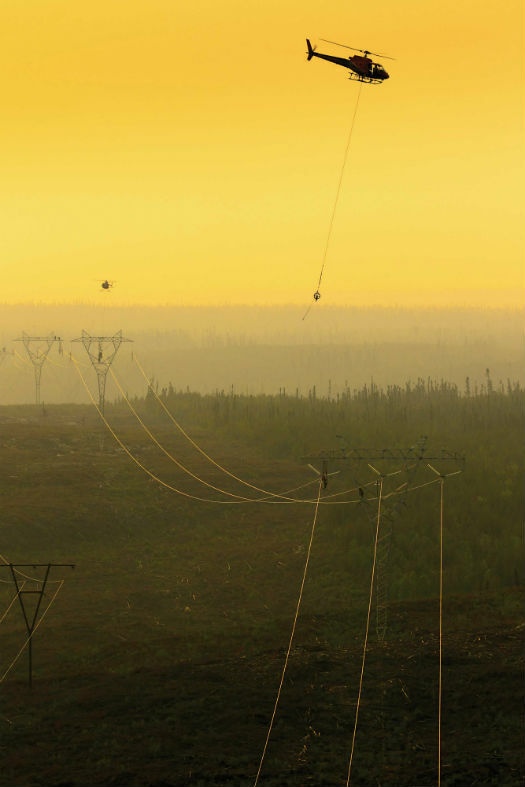 The 287-kilovolt line was powered on in summer 2014 and contains close to 1,100 transmission structures and 2,100 kilometers (1,300 miles) of transmission cable. Maintenance technicians take a look at the coaxial Ka-32 after a day of flying. Two mechanics travel with the aircraft to look after it in the field. In the south of the province, the $725-million ILM was scheduled to be completed this year. The 247-kilometer (153-mile) 500-kilovolt transmission line runs between Merritt and Coquitlam, and has been created parallel to an existing line. Once finished, it will carry enough electricity to power 80,000 homes. 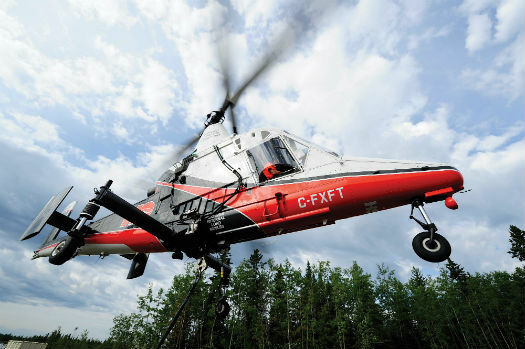 Helifor, based in Campbell River, B.C., was involved in both projects — as well as the I1K in Saskatchwan — and Chris Carswell, project manager of lift services at Helifor, said the company was seeing an uptick in power line construction work. “It is increasing — there are definitely projects coming online with the aging infrastructure and more demand for power,” he said. The ILM was the largest contract for Helifor, where it was tasked with falling and clearing the right of way, and then working on the tower foundations. Between its Vertol 107 and MD 500, it flew 2,300 hours on the project. The CH-54B Skycrane generally travels with a crew of seven, which includes four mechanics and three pilots. Blackcomb Aviation is another company that worked on both B.C. 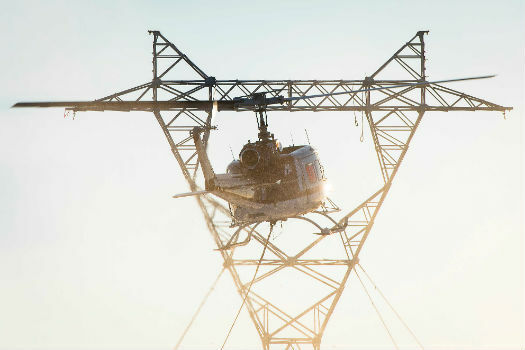 projects, typically using its three Airbus Helicopters AS355 N TwinStars to transport crew and materials, and pull sock line (a thin wire or rope used to thread the transmission line through tower pulleys). 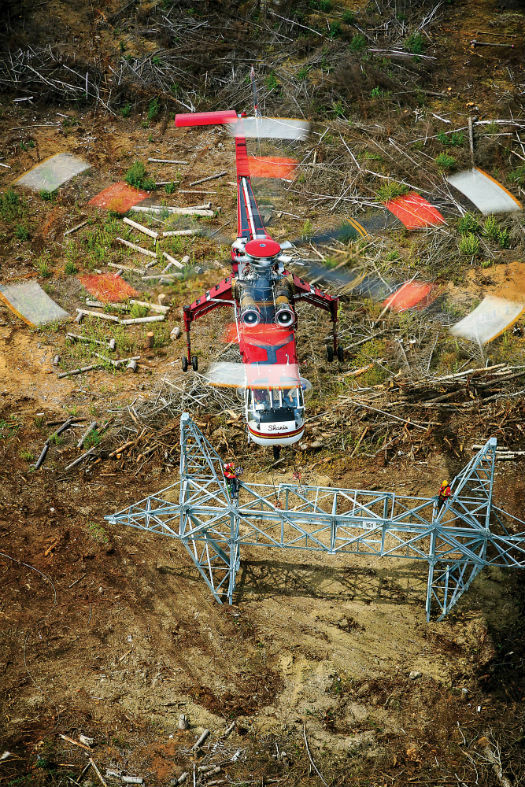 It also has a longstanding power line maintenance support contract with BC Hydro, and has been taking part in a spacer damper change program that requires long lining linemen onto energized wire with an Airbus Helicopters EC135 T2+ — making it one of a handful of companies in North America to perform this operation. 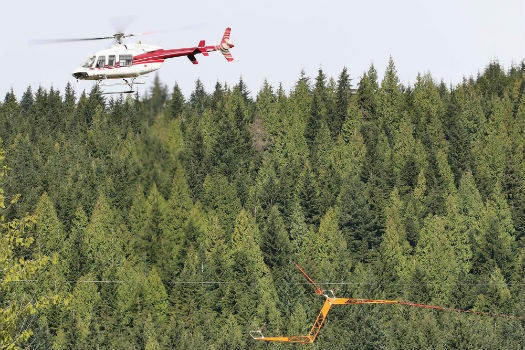 A Bell 205 from Helicopter Transport Services looks on from beside an old power line, as one of the operator’s Skycranes sets a tower on the line that will replace it. It’s highly skilled work, but Andrew Bradley, vice president of operations at Blackcomb, said that many of those who have the skills are the baby boomers who are now retiring from the profession. So what does he look for from those looking to get into this line of work? According to Bradley, power line work represents about 40 percent of the company’s overall workload — and over the last two or three years, much of that has been in construction. The next major power line construction project in Canada will see a 1,100-kilometer transmission line built between Muskrat falls in Labrador and Soldiers Pond in Newfoundland. 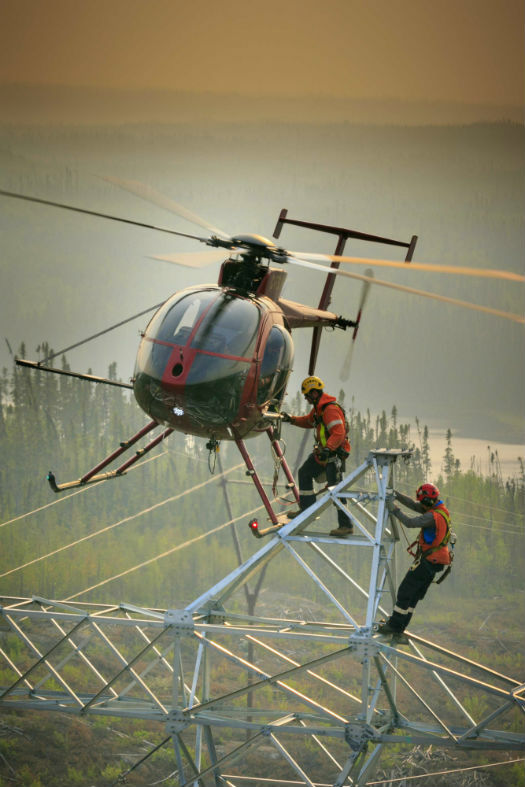 Tim Boyle, operations manager at Blackfalds, Alta.-based Mustang Helicopters, said the electric utility sector was one area that provided particular promise in an otherwise difficult market. Mustang generally uses its intermediates and Bell mediums for electric utility work. On the ILM project, it used a Bell 214 for foundation construction and during the construction of the towers themselves. The diverse range of aircraft types used on the ILM project was completed by the Kaman K-MAX, which was provided by Edmonton, Alta.-based HeliQwest. Bob Chalifoux, president and G.M. 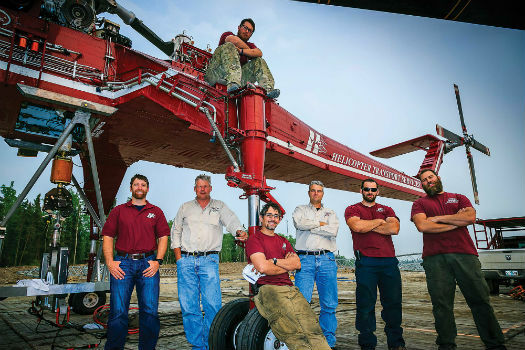 at HeliQwest, said the K-MAX, which can lift 6,000 pounds (2,720 kilograms), is a popular aircraft among ground crews on construction projects. 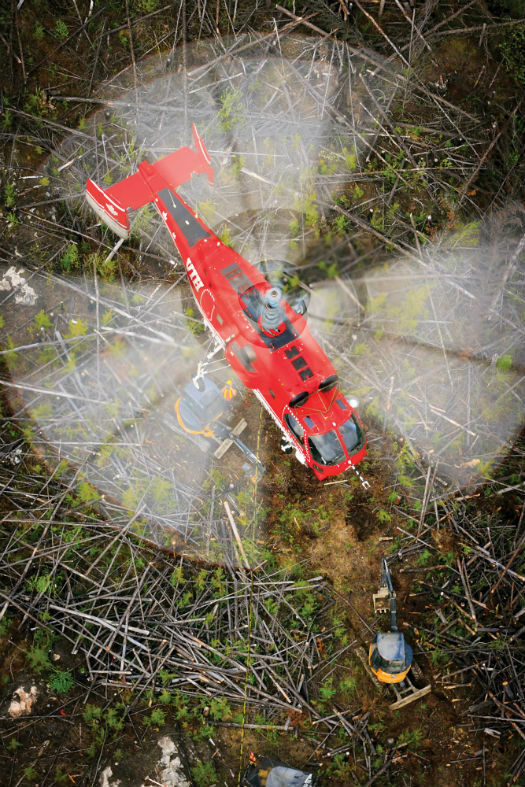 The operator flew up to six aircraft on the first year of the ILM project, including its Bell 206 JetRangers and Bell 205s, and was involved in operations throughout the construction process, from logging to setting towers. 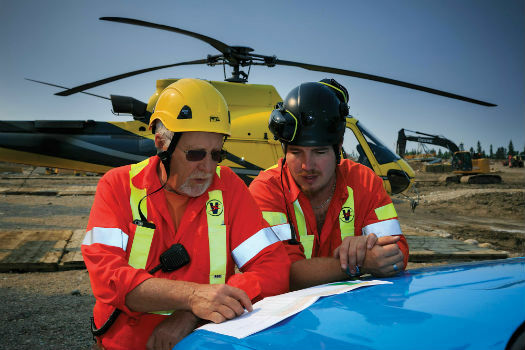 Bill Ross (left), helicopter operations manager for Valard Construction, discusses operations with pilot Matt Boekel. The next major infrastructure project in Canada is the Muskrat Falls project — which includes a 1,100-kilometer (680-mile) high voltage direct current transmission line between Muskrat Falls in Labrador and Soldiers Pond in Newfoundland. The overall cost of the project is estimated to be about $7 billion, with the transmission line representing about $2.7 billion of that. Work began in December 2012, and is expected to take about five years to complete. Valard won the contract for constructing the transmission line from utility company Nalcor, but Ross said that he didn’t expect the project to be as flying intensive as the I1K in Saskatchewan. 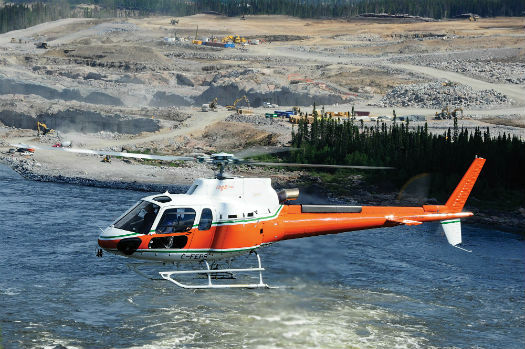 This sentiment was echoed by Geoff Goodyear, president of Universal Helicopters Newfoundland and Labrador LP (UHNL) — a Goose Bay, N.L.-based operator which has been subcontracted by Nalcor to provide additional support for the construction project. 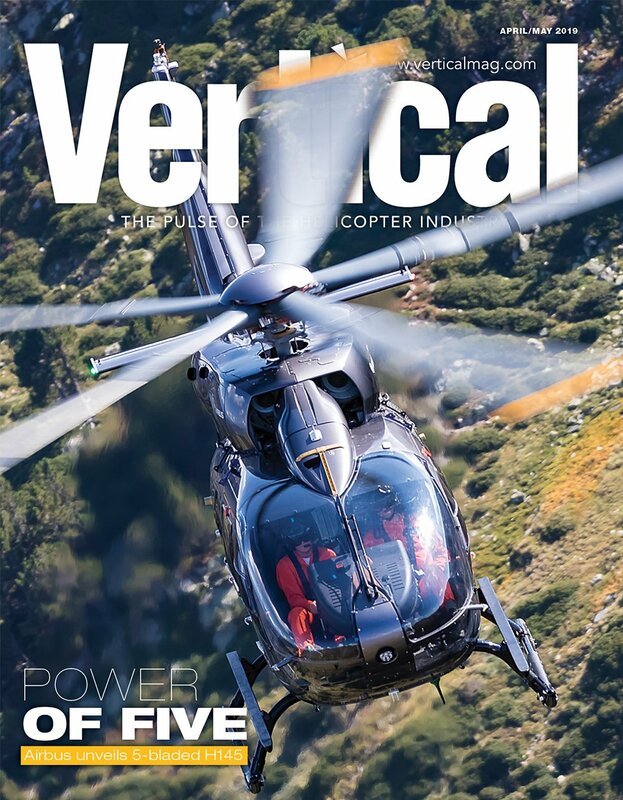 Universal’s involvement to date has involved using its AS350 B2s to move personnel and bridging material ahead of the construction process on the right of way. 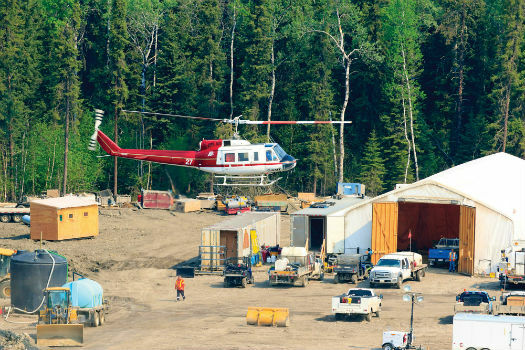 On the other side of the country, Lakelse Air’s Barry Holmes said the creation of the NTL could open the door to a great deal of potential work in northwestern B.C.’s “Golden Triangle” — a huge mineral-rich zone that contains several untapped world class deposits. 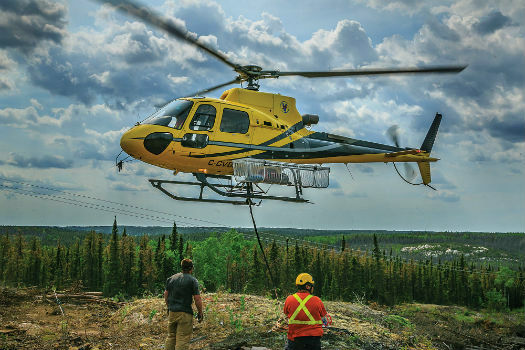 Lakelse, based at the southern end of the NTL in Terrace, was involved in clearing the right of way and tower construction for that project (using AS350 B2s, a Bell 204B, and Bell 212) — work that required highly experienced mountain pilots with expert long lining skills. Holmes said development of the Golden Triangle would require billions of dollars in construction investment, including the creation of access lines from the prospective mines to the NTL.